BHT program helps congregants at St. Margaret Mary Catholic Church and other churches in San Antonio. (April 17, 2018) -- Researchers at The University of Texas at San Antonio (UTSA) are taking diabetes education to church. Through the Building a Healthy Temple (BHT) program, they’re working with Hispanics who have type 2 diabetes to help them manage the disease and develop a healthier lifestyle. Dr. Meizi He, a UTSA kinesiology professor, Leah Carrillo, program coordinator of the BHT program, and their research team are working with partners from the San Antonio Metropolitan Health District and from faith communities to offer the Building a Healthy Temple Diabetes Self-Management Support (BHT DSMS) program in Bexar County churches. Their work is funded by the American Diabetes Association. According to the Centers for Disease Control and Prevention (CDC), more than 1 in 3 U.S. adults have prediabetes and 40% adults are expected to develop type 2 diabetes in their lifetimes. Hispanic people are at greater risk than non-Hispanics. More than 50% of Hispanic adults are expected to develop type 2 diabetes in their lifetime. A recent survey showed that the prevalence of diabetes is 6.2% in whites and 13.0% in Mexican Americans. “The Hispanic population experiences high rates of type 2 diabetes as well as severe complications such as amputation, kidney failure and blindness. Ongoing diabetes self-management is necessary to prevent these complications,” said He, who was trained as a medical doctor in China before joining the UTSA faculty. The 14-week program integrates spirituality and health education strategies to investigate the impact of a spiritual support system on diabetes self-management outcomes. He said about 360 participants will take part in the study through 2019. Participants are placed in either a routine diabetes self-management group or a spiritually integrated diabetes self-management group. Both groups attend the evidence-based Diabetes Self-Management Program created by Self-Management Resource Center formerly known as the Stanford Patient Education Research Center at Stanford University and other resources related to diabetes at their respective churches. “Building a Healthy Temple has great potential to improve health outcomes and quality of life among underserved Hispanics with type 2 diabetes,” said Carrillo. According to data by the San Antonio Metropolitan Health District, 14.2 percent of Bexar County adults have been diagnosed with diabetes (type 1 or 2), which is higher than both the Texas and national average. Experts project that the number of Americans with diabetes will double or triple by 2050 if current trends continue. The Building a Healthy Temple program offers training to faith leaders to provide resources and information to congregants about diabetes, healthy eating, exercise, controlling diabetes symptoms, goal setting and weight management. Faith leaders will be able to discuss and explain different techniques to deal with symptoms of diabetes, fatigue, pain, hyper/hypoglycemia, stress and emotional problems such as depression, anger, fear and frustration. In the current program, six churches are involved from the city’s south, west and east sides. He said the researchers are recruiting more churches to get involved in the program, with the goal of including 18 churches overall. This program is part of a cluster of faith-based health promotion programs that make up UTSA’s Building a Healthy Temple (BHT) initiative. The mission of BHT is to create healthier communities by addressing obesity and obesity-related health issues. 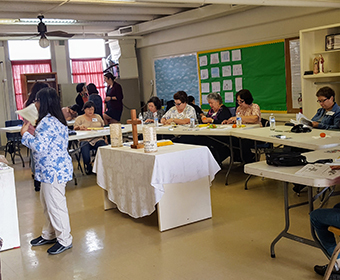 The program strives to prevent obesity, cancer, and diabetes as well as manage chronic diseases in faith-based communities through the integration of spiritual and physical health promotion. Learn more about Meizi He.